Sockeye salmon is a primary food source for the Syilx, or Okanagan people. The salmon comes from the Okanagan River upstream of Osoyoos Lake, B.C. Historical fishing camps were located at McIntyre Bluff and Okanagan Falls for thousands of years. Until recently, local sockeye salmon stocks neared extinction due to habitat loss, impassable dams, over-harvest, and climate change. 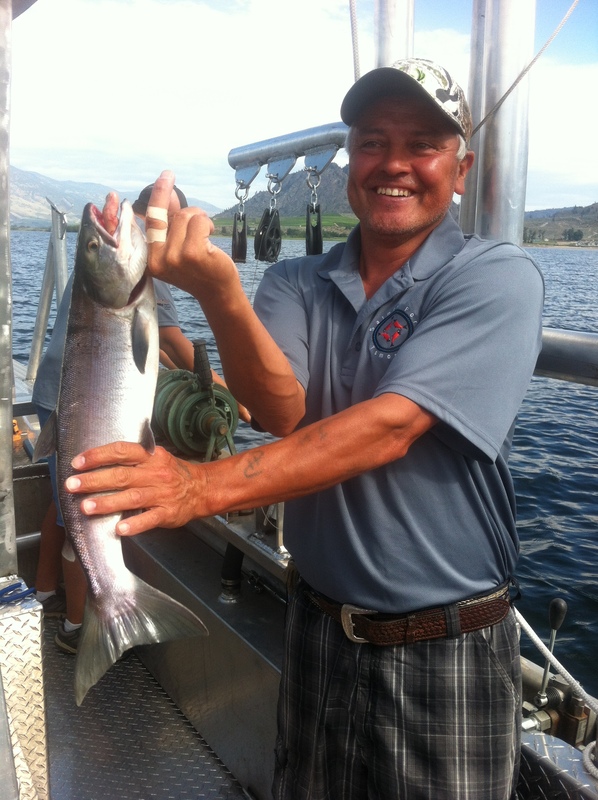 Since 2003 the Okanagan Nation Alliance (ONA) has maintained a dedicated initiative to re-establish a sustainable population of sockeye salmon in Skaha and Okanagan Lakes, integrating modern science with traditional practices. Kt cp’elk’ stim’ is a Syilx word meaning “cause to come back.” Kt cp’elk’ stim’ is a dedicated initiative to re-establish a sustainable population of Okanagan Nation Sockeye Salmon. The Okanagan Sockeye Salmon has throughout generations been the mainstay for the food and trading traditions between First Nations bands in the centre of British Columbia and United States. Eight First Nations bands have been working together to re-establish this traditional food source. Today, the years of hard work and dedication are paying off. In 2010, the first time in over 75 years, they had a sustainable population and sockeye runs were in the hundreds of thousands. Adult sockeye are trapped and acoustically tagged at Wells dam within the Columbia River. Their migration is monitored with acoustic receivers along both the Washington and B.C. portions of the Okanagan River as well as Osoyoos Lake. The tags are deployed across the run and provide a population estimate and run timing of the migration into Osoyoos Lake. For in-season harvest, the tags provide an estimate for the number of fish within the lake, and an estimate of fish caught based on tags harvested (mark-recapture estimates). This ensures the stock is only harvested within a level that meets all escapement (spawner/conservation) targets for the year. There are also many other research components including the in-season monitoring of the Osoyoos Lake limnology and the use of the FWMT (fish water management tool) that informs water managers on how to manage water levels to ensure in-lake and in-river survival, across both juvenile and adult life histories. They utilize abundance-based methods to allow the fish to get to the spawning grounds, honour ecosystem-based fishery and practice lifecycle analysis to understand the fishery and it’s impacts. To ensure the sustainability of the salmon and our local ecosystem, fish are handpicked with fish-friendly methods – e.g. troll, seine, traps, and dip net. The ONA has turned traditional concepts into modern selective fishing practices to minimize bi-catch. The Okanagan Nation has only a small artisanal fishery that allocates annually- appropriate harvests, respecting community food and social needs, followed by economic opportunities, eco-tours, and recreational fishing. The Nation integrates Chaptikwl (oral history) to integrate traditional protocols today to sustain fishing cultures, and believes in a community-based fishery with the goal of revitalizing traditional fishing camp practices. The Syilx culture respects the land, leaving portions of carcass to create ecosystem health. Our fish waste is returned to the river of origin. The backbones/fish heads are distributed to community for fish soup. Portions of fish waste are given as food for eagles and owls for Okanagan restoration recovery efforts. The peachy orange flesh of the salmon is described as having a perfectly balanced flavour, being equally buttery and light, while at the same time being juicy and refined. It is available fresh from July through until early September. It can be purchased frozen year round, as well in cans, and preserved as Indian Candy. We are from Vancouver and just recently saw a fabulous promo you did for the salmon, so decided to search for some canned product as a gift. We happened to be visiting the area and went to Watermark and the Nk’mip Desert Cultural Centre. Watermark only serves in the restaurant, the Cultural Centre had never heard of it! Is there indeed a place where we CAN purchase some? Would also like to know if Choices on Davie in Vancouver carries, but cannot search their website. Thank you, for your interest in Okanagan Select canned sockeye. While some of our canned and smoked salmon products are available in artisanal retail outlets throughout the Okanagan, we have limited outlets for purchase in the Vancouver area. Fortunately, we are able to ship your order.